Samuel Ehret is an official “Spambassador”at the museum, a hot spot for tourists who have a taste for the much-mocked canned meat that has been made here by Hormel Foods for 81 years. 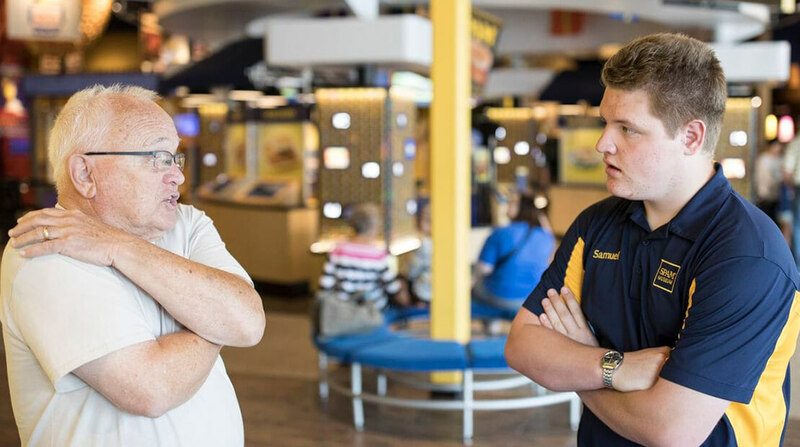 Samuel is also autistic, and he got this job because he loves all things Spam — its taste, its history, and especially the museum’s showpiece: a motorcycle that runs on bacon grease. He also landed the job because Austin is an autism-friendly town. Ten years ago, it became one of the first in the country to launch a community-wide effort both to reduce the disorder’s stigma and make local businesses aware of the special needs of autistic customers. It is also probably the only small town in America to employ a community autism resource specialist. The mission was “a grass-roots effort to improve our community,” said Mary Barinka, an employee of the nonprofit Hormel Historic Home, where she serves as an autism resource liaison for Austin. She is also a former Hormel marketing executive, and the mother of a 16-year-old daughter with autism. For someone like 18-year-old Samuel, the town’s attention to the condition has been invaluable. “This is my son,” she said to herself. Autism is a neurodevelopmental disorder that is characterized by delayed language, repetitive behaviors, sensory sensitivities and difficulty with social skills. Although the symptoms of autism can overlap with other developmental disorders, such as learning disabilities and attention-deficit/hyperactivity disorder, it has distinctive characteristics, including narrow, intense interests and routines and occasional emotional meltdowns when those routines are disrupted. More than 3.5 million Americans have been diagnosed with this disorder, according to the Autism Society. In April, the Centers for Disease Control and Prevention revised the estimate of those with the disorder to 1 in 59 children, four years after it was set at 1 in 68. Most experts attribute the increase to more-precise diagnostics and enhanced awareness of the disorder, particularly in black and Hispanic children. Fifteen businesses in this Midwestern hamlet carry the official designation “autism-friendly.” Among them: the Paramount Theater, Mid-Town Auto, two dentists, two ophthalmologists, two hair salons and three summer day camps. To qualify as autism-friendly, a business must make an effort to minimize sensory overstimulation — lowering lights, turning down or eliminating loud music, and shielding the individual from others’ cross talk. Business owners must fill out an application and then, along with their employees, go through educational sessions. They learn about the difficulties people with autism experience, including their triggers — a sound or a smell or an unfamiliar situation that may cause a meltdown. They also learn how to interact by speaking slowly, in a clear voice and in short phrases. Most important, they are shown the value of learning to be patient and flexible. Jackson Schara has been to dentist Catherine Guy a number of times, and his first visit was so surprisingly comfortable that he made a YouTube video explaining why other people with the condition shouldn’t be afraid to go to an autism-friendly dentist. “It’s a sensory thing, so I told him about the armrests, the bib around the neck, that the chair will move. Then I offered him a bear or a weighted blanket on his chest for comfort. Sunglasses protect the patients from the harsh lights used to peer inside a mouth. A mirror is also available if they want to watch the dentist at work. The value of these autism-friendly efforts is incalculable, families say, because it not only makes the lives of those living with autism easier, it also allows them to have experiences that those without autism have routinely. Best of all, they are lessons in communication, one of the chief skills that many children with autism must work especially hard to develop. Jackson’s mother, Heidi Schara, remembers well a breakthrough moment she witnessed when her son came home from school one day. She credits these eu­reka moments, in part, to Austin’s unusually open environment. “Having this autism-friendly movement — it’s incredible to have people who want to understand,” she said. For Jackson, who has a love of Japanese monster movies and is eager to talk about all things Godzilla, the experience at Guy’s office as well as at a hair salon in town have been revelatory. “I am surprised at what I’ve done. Legitimately surprised,” he said. Jackson was so comfortable getting his hair cut at the Style Lounge that he made a video of it. Austin’s autism-friendly program began a decade ago, when a retired Hormel executive, Gary Ray, telephoned Barinka, a family friend, and asked whether her autistic daughter, then 6, was able to participate in any town activities, such as summer camp. Austin is small enough that Ray and his wife, Pat, were familiar with Barinka’s struggle to find appropriate recreation for her daughter. To date, the Rays have contributed more than $100,000 to fund autism-friendly programs in Austin. One of the more successful is the monthly respite night, when children with autism are dropped off at the Hormel Historic Home — a site for weddings and tours as well as community events — and parents or caregivers are given a few hours of free time. The children might do an art project, or go out to a restaurant, bowling lanes or the YMCA to swim. The lifeguards are taught to get their attention by calling their name instead of blowing a whistle. The Y sponsors swim teams for children with autism, and they occasionally compete against other teams with disabilities, including at the Special Olympics. Autism-friendliness has also reached into the schools, where a peer program pairs high schoolers with autism with similarly aged student volunteers. The program is so popular that there is a waiting list of student volunteers. Word of Austin’s unusual autism-friendly services has resulted in at least a half-dozen families moving to the town. Carolyn Dube grew up in Austin, but she spent much of her life elsewhere, primarily in Phoenix, where the resources for her son, Alex, diagnosed with autism at 2½ , were lacking. A new job brought her to a suburb of Minneapolis, about 90 minutes from Austin, and Dube began to pick up stories about her hometown’s transformation. Dube’s family moved back to Austin when Alex was 4. He’s in high school now and takes mostly mainstream classes. He is especially talented in math and science, and because autism is a spectrum disorder of varying degrees of disability, Dube fully expects him to go to college and study engineering. “Now Alex is almost a new person,” she said. Other parents say they’re seeing progress they never thought possible before Austin became autism-friendly. Barinka’s 16-year-old daughter used to bite the chain-link fence at her older sister’s softball games and throw tantrums. Today, she is on her high school dance team and plays the trumpet in the band. Barinka has received calls from Salt Lake City and Flagstaff, Ariz. inquiring about how to set up their own autism-friendly programs, furthering a trend of entrepreneurship and innovation by individuals in the autism community. In 2015, for example, Pennsylvanian Topher Wurts, a marketing and technology executive who has a son with autism, founded a virtual Autism Village. It’s an app that works a bit like Yelp, locating nearby autism-friendly places and businesses and letting users rate and review their experiences. How Barinka helped create her own bricks-and-mortar version of an Autism Village included not only the Rays, but also the Hormel Foundation, the Hormel Historic Home and numerous members of the community, both paid and volunteer, who make the programs run. Because of such contributions, Austin is able to offer services at vastly lower costs than those in places where camps can run as high as $800 or $900 a week, according to Barinka. Austin’s autism day camps cost just $150, and many of the more than 50 campers receive scholarships, bringing the price down to $25. On a recent Monday during camp week, a small group of boys stood in the kitchen at the Hormel Historic Home and listened to the leader, Cassandra Bartholomew, describe how to make a pudding snack. The last step of the recipe appeared to be everyone’s favorite: crushing cookies to sprinkle on top of the pudding cups. Each boy took a turn using his fist to hammer the cookie pieces into crumbs. A finishing touch: tiny, tropical umbrellas, stuck into the middle of the dessert cups, which had the boys chattering with excitement. “Let me see,” another answered, opening and closing the umbrella a dozen times. The two boys attend Circle of Friends Day Camp for kids entering first through fifth grades. Samuel Ehret, the “Spambassador,” is a member of All Access Community Explorations for those in grades six through 12. One of the original campers 10 years ago, Samuel benefited from the group activities — sports, art, community trips — that were a large part of his camp experience. He also came home with more social skills, which he has used in his various part-time jobs. Before the Spam Museum, he made sandwiches at the senior center and worked at the town’s Ford Motor dealership. But his favorite job was at a nursing home, helping the activities director with Alzheimer’s patients. Today, it is clear that his role as a Spambassador suits him well.